Since I seem to keep losing my little printed volume that contains the text of the Constitution, it seemed to make sense to just put it here. The National Archives has full text and related information on its Charters of Freedom site. The U.S. Congress has a great Analysis and Interpretation page that provides good insight into how the Constitution really works. 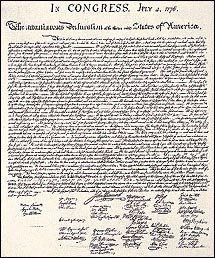 Every Bill which shall have passed the House of Representatives and the Senate, shall, before it become a Law, be presented to the President of the United States: If he approve he shall sign it, but if not he shall return it, with his Objections to that House in which it shall have originated, who shall enter the Objections at large on their Journal, and proceed to reconsider it.If after such Reconsideration two thirds of that House shall agree to pass the Bill, it shall be sent, together with the Objections, to the other House, by which it shall likewise be reconsidered, and if approved by two thirds of that House, it shall become a Law. But in all such Cases the Votes of both Houses shall be determined by yeas and Nays, and the Names of the Persons voting for and against the Bill shall be entered on the Journal of each House respectively. If any Bill shall not be returned by the President within ten Days (Sundays excepted) after it shall have been presented to him, the Same shall be a Law, in like Manner as if he had signed it, unless the Congress by their Adjournment prevent its Return, in which Case it shall not be a Law. The judicial Power shall extend to all Cases, in Law and Equity, arising under this Constitution, the Laws of the United States, and Treaties made, or which shall be made, under their Authority;--to all Cases affecting Ambassadors, other public Ministers and Consuls;--to all Cases of admiralty and maritime Jurisdiction;--to Controversies to which the United States shall be a Party;--to Controversies between two or more States;-- between a State and Citizens of another State;--between Citizens of different States;--between Citizens of the same State claiming Lands under Grants of different States, and between a State, or the Citizens thereof, and foreign States, Citizens or Subjects.